Exmouth Ningaloo Fuels provides a card operated, self-service discount fuel station that is open to the public 24 hours every day. 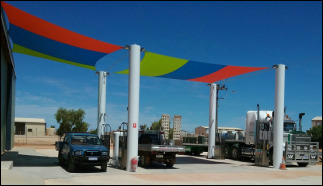 The fuel station is located 9km south of the Exmouth township in Western Australia, within the Exmouth Industrial Area. The credit card operated fuel pumps deliver Diesel (at both normal and high-flow rates) and Premium 95 petrol. Our current discount fuel prices are 166.4 cents per litre for Diesel and 170.4 cents per litre for Premium 95 petrol. Turn off the Minilya-Exmouth Road (the main highway) at Ingram Street, the fuel station is just a few hundred meters from the main highway. The forecourt is large and easily accessible by large vehicles including trucks and those towing large caravans and boats. Our lower overheads allow us to offer top quality fuels at prices consistently well below the prices offered by the fully staffed fuel stations located in the township. Our current discount fuel prices in Exmouth are: 166.4 cents per litre for Diesel and 170.4 cents per litre for Premium 95 Petrol.